I officially have my ticket to Vietnam this summer! I’m excited about that, even though it presents me with some new challenges that I’ve never had to conquer before. Specifically, I’m referring to money. 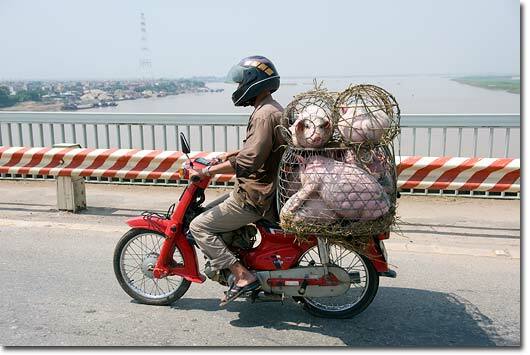 It's impressive the kinds of things you can fit on a scooter... even Live PIGS! As you can see, I have a lot of work to do to catch up to this amount of money. Luckily, the ticket has already been purchased (still have to pay it off though). I’ll be sure to keep everybody updated as time goes on! In the meantime… check out how insane traffic is there. These people are crazy with those scooters! If I win the lottery I will give you some money! What are my odds? Not good. Glad you’re trying though! Ha!